Art that interacts with and improves local communities is essential for maintaining—and improving—our quality of life in Wisconsin. Thankfully, we have a state agency dedicated to cultivating and promoting arts that make our communities great: the Wisconsin Arts Board. Even though the Arts Board is celebrating in 2014 their forty year anniversary of supporting community arts programs, people are sometimes surprised to discover just how much influence they have. 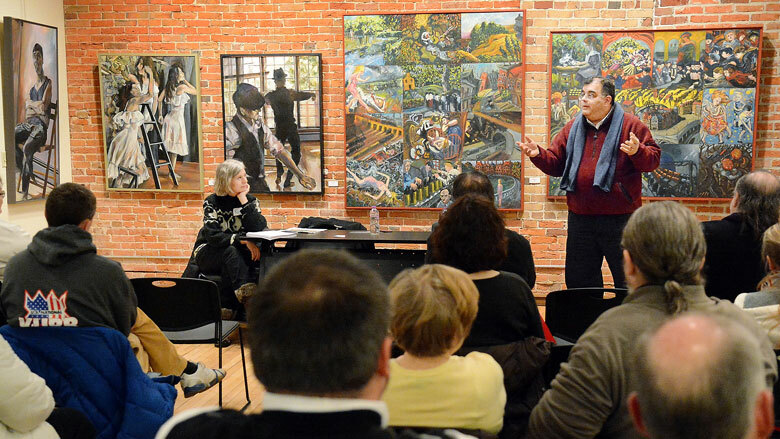 “Technical assistance on the front end of things tends to get lost over the years,” says Wisconsin Arts Board director George Tzougros. “Without the Arts Board fanning the early flame of a project, you don’t get the successful piece at the other end. But it’s rare that people know about this early history,” he adds with a chuckle. One type of behind-the-scenes work the Arts Board does is to advise individual artists and arts organizations and help them overcome challenges. For instance, Tzougros and assistant director Karen Goeschko travel to coffee shops and community centers across the state to hold Office Hours on the Road where they answer questions like, How can I start an art studio? or How can we plan a public mural project? One of the perennial questions Tzougros encounters during Office Hours has to do with artists seeking connections to other artists or organizations. If it is promotional or networking help they want, Tzougros usually directs artists to Portal Wisconsin, the online arts and culture community created by the Arts Board and other members of the Wisconsin Cultural Coalition. (Editor’s Note: The Wisconsin Academy is part of this coalition.) Portal is a great resource for people working in the fields of arts, humanities, and history, with up-to-date postings on auditions, calls for artwork and conference paper submissions, jobs, residencies, and other opportunities for artists across the disciplines. In addition to creating connections between individual artists and organizations, the Arts Board also encourages collaboration on a larger, institutional scale. As an example, Tzougros relays the history of Film Wisconsin, a nonprofit organization that reaches out to people who are interested in making films, television programs, even video games in Wisconsin. When the state film office was eliminated from the Department of Tourism in 2005, the Arts Board created and facilitated a task force with film industry leaders in Green Bay, Madison, and Milwaukee. “Somebody’s got to send the e-mails, create the distribution list, make sure that lunch is ordered—all of that kind of stuff,” Tzougros says with a smile. From these Arts Board task force meetings emerged Film Wisconsin, which incentivizes the local production of multimedia entertainment ventures. Film Wisconsin was responsible for bringing film crews for Public Enemies, the 2009 Universal Studios movie starring Johnny Depp, to several locations across Wisconsin. While projects like this provide national (even global) visibility for our state, they also support Wisconsin’s economy. Production teams patronize local hotels, restaurants, car and prop rental shops, and other businesses during shooting. Public Enemies alone spent $7.4 million on Wisconsin workers and vendors, and the movie and television industry as a whole is responsible for almost 8,000 jobs and $206.3 million in annual Wisconsin wages. These types of mentoring and networking efforts are, as Tzougros characterizes them, “the invisible hand” of the Arts Board, elevating both the quality and quantity of arts in the state. Perhaps more visible expressions of Arts Board support are grants that fund specific projects as well as the seasonal work of arts organizations. The popular Creative Communities grants support projects in the areas of arts education, folk and traditional arts, and local arts. Eligible arts education projects bring arts programs to K–12 grade students, whether it’s within schools or in the community at large. Folk and traditional arts funds go to projects that document, display, or otherwise honor the work of traditional and folk artists. Local arts grants support projects that include public participation and planning, with an emphasis on projects embracing cultural diversity. Shakespeare on the Edge, a recent recipient of a Creative Communities grant in the area of arts education, used Arts Board funds to develop Shakespeare! By Kids, for Kids! Participation in theater helps youth to “develop character, self-esteem, confidence, peer-bonds, and combat bullying,” Shakespeare on the Edge reports in its mission statement. Their major project was a February 2014 community youth production of Shakespeare’s comedy Much Ado About Nothing at the Monroe Arts Center. The Chippewa Valley Museum in Eau Claire was awarded funds under a Creative Communities grant in the area of folk and traditional arts for Intersections, an exhibition showcasing the work of regional artists. Opening in July 2014, Intersections features the needlework of Hmong artist Mai Xee Xiong, canoes built by Ojibwe artist Wayne “Mino-Giizhig” Valliere, and the ornate turkey calls of Scott Wilhelm. These artists are stewards of the diverse cultural traditions of Wisconsin. By sharing their work in a long-term exhibition, the Chippewa Valley Museum helps preserve and celebrate the cultural fabric of our state. nt work. Hopefully they will continue to mentor arts programs, foster collaboration, and provide funding to sustain the arts—and support the arts economy—long into the future. While the Arts Board’s work has widespread influence, the agency’s many ongoing efforts are not always recognized as interconnected. So the next time you attend a film festival, enjoy a youth theater production, or experience a new form of folk art and feel inspired, keep in mind the role the Arts Board has in fanning the flames of inspiration and creativity in your community. Augusta Scescke is a former editorial assistant for Wisconsin People & Ideas. She is a 2013 graduate of Northeastern Illinois University with a degree in Sociology. Her research history includes an interview and photography project about the meanings of quilting to Appalachian women.